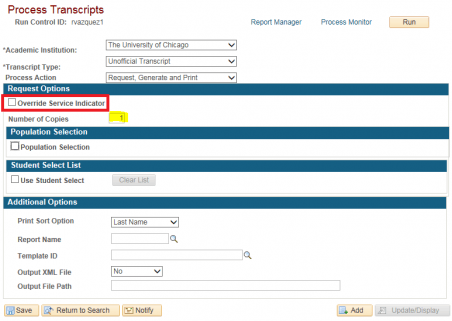 Staff members with the ability to view student grades in my.UChicago can also view the student transcript. 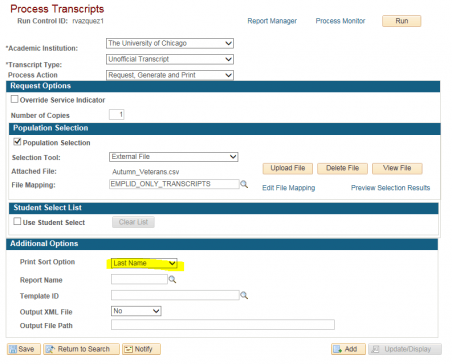 As an administrator, you can request individual transcripts or you can request transcripts in batch. Instructions are listed below. 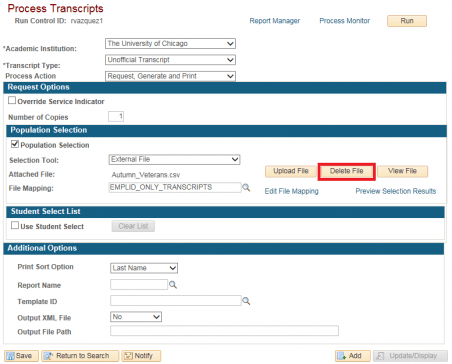 On the first tab, select a Transcript Type of UNOFF (Unofficial Transcript) or ADVS (Internal Advising Transcript). 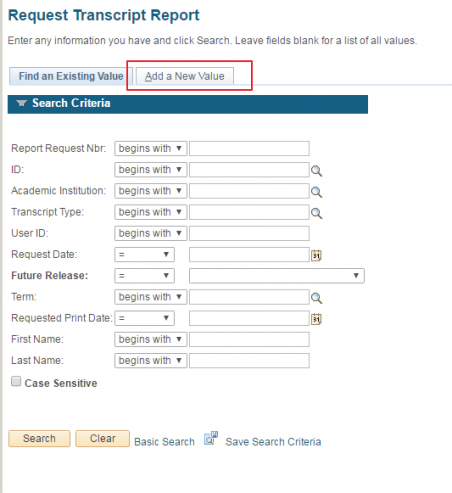 On the second tab, enter the ID numbers for all of the students whose transcript information you want to view. Then click Process Request. 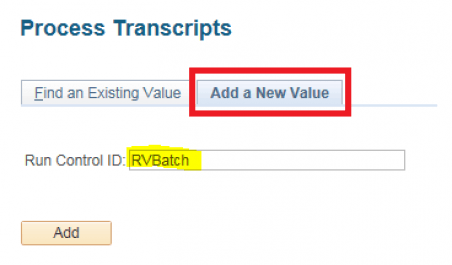 Click View Report to view an individual student’s transcript. The report will load (this may take up to a minute) and open in a new tab/window, depending on your browser settings (be sure to allow pop ups on the page). 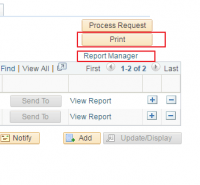 To print multiple transcripts in one PDF, click the Print button and then Report Manager. Click refresh until the UCSR_TSRPT – UCSR_TSRPT.pdf report has posted. Click on that link and the consolidated PDF will open in a new tab/window or download, depending on your browser settings. Create your batch source file by entering the UCID/EMPLID in an Excel document. The file should have no header row and all IDs should be in Column A, beginning with cell A1. Once all ID’s have been entered, the file must be saved as a CSV (Comma delimited) (*.csv) file. 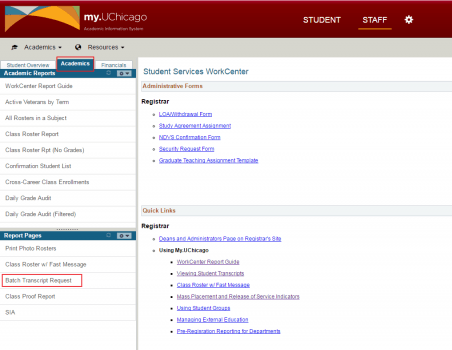 In the Student Services Work Center, click on the Batch Transcript Request link under the Report Pages menu. 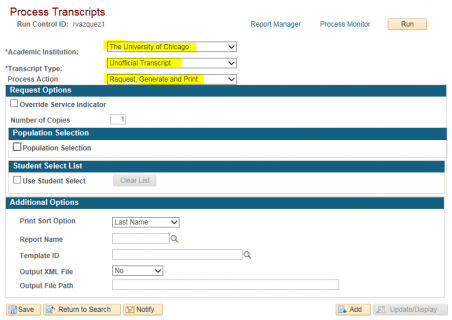 In the Request Options section, enter the number of transcript copies needed. Note: If appropriate, you can click the Override Service Indicator box to ignore any transcript holds on records in your population. 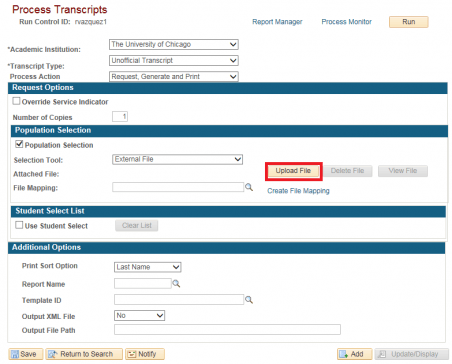 Otherwise, if a student has a transcript hold, their transcript will not print in the batch. In the Population Selection section, click the Population Selection box and select External File in the Selection Tool drop-down. If this is your first time running a batch, click the Upload File button, and use the browse option to find, attach, and upload your file. If you’ve run a batch before, the previous file you uploaded will still display. Click the Delete File button to the right of the Upload File button to remove the file. You can then proceed with Upload File and follow the steps below. 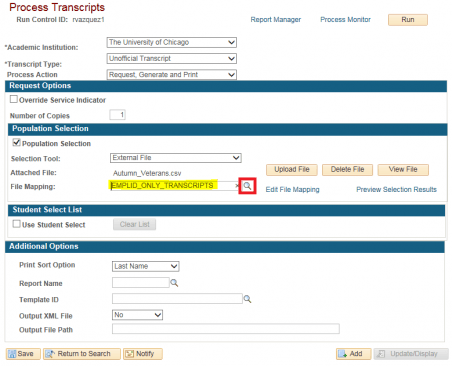 Click the magnifying glass in File Mapping field and select EMPLID_ONLY_TRANSCRIPTS. To make sure your file mapped properly and the batch will run successfully, you can click the Preview Selection Results link on the right. You should see something similar to the image below with each row listing a UCID. If the file is incorrectly formatted, you will see something similar to the image below with strange characters instead of EMPLIDs. If you need to delete the file, click the Return button at the top left to exit the preview and return to the Process Transcripts page. Remove the erroneous file by clicking the Delete File button and then upload a corrected file before proceeding with the steps below. In the Additional Options section, use the Print Sort Option drop-down to determine if you want the batch file to sort by Last Name or Student ID. When you are ready to create the batch file, click Run on the top right. In the Process Scheduler Request screen, check the box to the left of Process transcripts, make sure the *Type is Web and *Format is PDF, and click OK. Important: Do not check the box for PRCH. This is a job specific to Parchment transcript processing and should not be used. In the Process Transcripts page, click on the Process Monitor link that is left of the Run button. Click the Refresh button on the top right periodically until the Run Status says “Success” and Distribution Status says “Posted,” indicating that the file is done. Click the Go back to Process Transcripts link above the Save button. 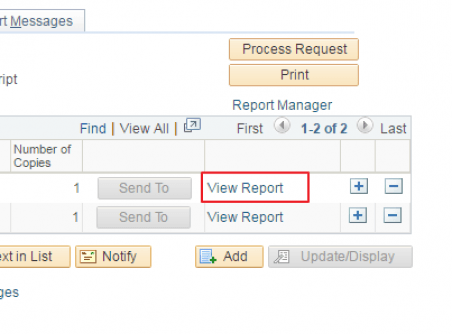 Click the Report Manager link in the top center of the Process Transcripts page. 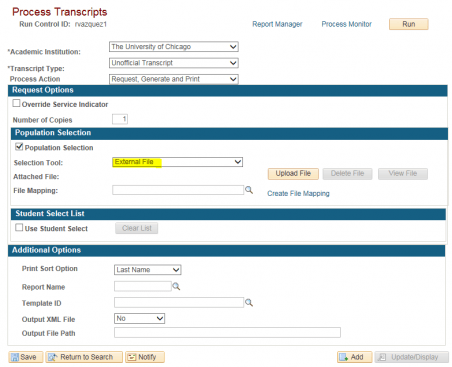 In the Report Manager page, click on the Administration Tab and click the link to the .pdf file of the transcript batch you just created, UCSR_TSRPT – UCSR_TSRPT.pdf. The batch file of unofficial transcripts will open in a new window as a PDF file.